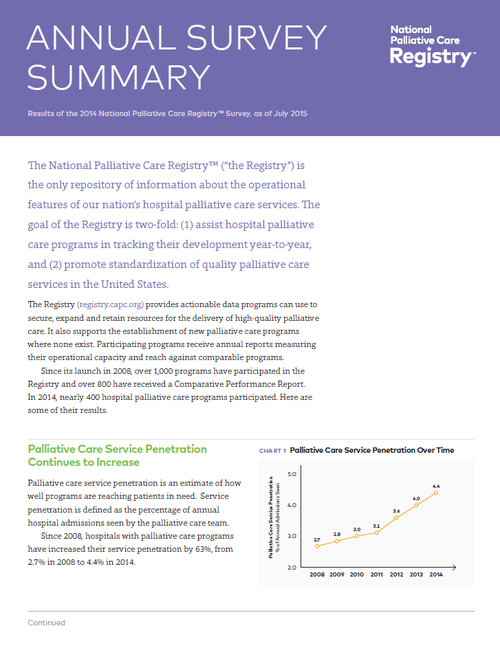 The Center to Advance Palliative Care (CAPC) and the National Palliative Care Research Center (NPCRC) have released the results of the 2014 National Palliative Care Registry™ Survey. Teams with the highest staffing levels (2.7+ FTE per 10,000 admissions) reach 6.5% of all hospital admissions, while the smallest teams (<1.2 FTE) reach only 2.9%. In 2016, the new National Palliative Care Registry™ is expanding to include all settings (home, nursing home, office practices, in addition to hospitals) across the continuum of care. Programs who submit data will have access to both cross sectional and longitudinal tables, graphs and comparative reports. Beginning in early March, hospital and community-based programs can submit data for the 2015 calendar year as well as enter or edit historical data. Hospital programs will have immediate access to tables, graphs and comparative reports; reports for community-based programs will be developed as data are collected over the next several months. The Registry is free and open to all. Visit the Registry at registry.capc.org.